I'm still not quite sure what to make of Boom! Studios' comics, as they tend to vary wildly in scope. I certainly can't fault them for taking some publishing chances, such as this comic series which is about a second alien attack on earth, shortly after the first. Though rebranded for the trade paperback as a separate entity, the single issues were tied into H.G. Wells' War of the Worlds, which helps give the series some context that I was lacking when reading the trade. Once I saw that when doing my research for this review, it helped give what I had read better grounding. Why Boom! took the "War of the Worlds" part off the trade is a mystery to me (rights issues? ), because knowing that would have helped me a lot. As it stood, coming in cold, I had a hard time picking up on context, and had to learn as I went. It's to Nelson's credit that he does a pretty good job of this, as I wasn't bothered much about being thrown into the middle of the story. However, references to Mars, disease, and the state of the country, all of which make much more sense now to me, were a bit lost in the translation as a result. In Second Wave, the aliens have returned to terrorize at least the United States again, shortly after the first attack. One survivor, Miles Walker, cannot forget what the aliens cost him. When they return, he wants to do for others what he could not do for his wife--save them. Starting with his best friend and adding fairly typical disaster movie characters as they go, the motley band tries to make their way through an American dream turned into an American nightmare--complete with those who wish to make their own laws. If they can survive constant alien attacks, will it be worth it, given the low value on life placed by the remaining humans on the planet? Unfortunately, it's a moot question because I can't see any evidence this went past the initial six issues, leaving the reader on a hopeful but annoying cliffhanger. The story itself isn't bad, except that it doesn't really do anything interesting with the world in which we find Miles. You could swap out the aliens for zombies or a post-nuclear world, and it wouldn't change much, if anything, in the course of the story. Nelson hits all the right fear buttons, placing the protagonist in harm's way, showing the ugly side of humanity--all the proper notes for a disaster story. The problem I had is that he only does just that--hit them. They aren't developed very far, the terror never lasts longer than a few pages, and I'm never convinced that something bad is going to happen to anyone in the party. That's a real problem in a story of this nature. You have to be willing to kill a key character off in order to make the reader believe anyone is mortal. Yes, deaths happen, but all too rarely for a teen and up comic about a cataclysmic world event. If you aren't willing to do that, then there must be some other hook, and the flashbacks to Miles's prior, ordinary life, just wasn't enough for me. His regret at being a failure to his wife didn't register for me and that seemed to be a key part of the story. Artistically, Chee's work is serviceable to the story and is clear to read. He employs a few clever tricks, such as varying panel sizes from page to page or morphing bullet casings into the pills Miles is supposed to be taking, but misses continuity details like broken glasses. Overall, it did the job but didn't help Nelson's script any by making the action zip across the reader's eye. I think Chee's weakest points were conveying action and movement, such as when figures who looked posed are supposed to be running. Had the art been a bit more free-flowing, it would have helped me get into the story better. 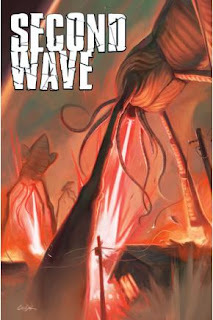 Second Wave is not a bad story, but it's also probably not worth looking for. I'd be open for reading more of this story, but I don't think it was continued after the first six issues. Average writing and artwork combine with an incomplete story to lead me to feel that Second Wave is probably not worth a second look for you, unless you're a big fan of H.G. Wells or disaster stories.